A Czech crystal company, Krystaly, Hradec Králové, a.s. is able to produce 20mm crystals. The crystals are not clamped between stainless steel plates, like the wartimes FT-171 or DC-35 versions. 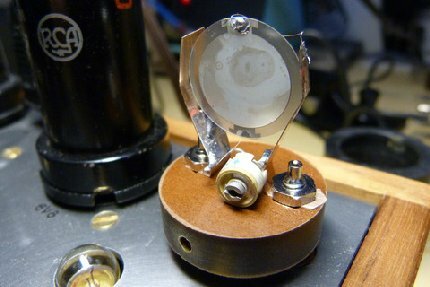 The crystal is round, with 20mm diameter. The contact surfaces (very thin layer of silver) are applied on both sides, with a short lead on each side. So the crystal is not swinging between 2 fix metal plates: The whole system, crystal and contact area, is moving. My friend, Karel, from the Czech Republic and I, decided to give them a try. They offered the crystals with a smaller contact disk, but we wanted to spread the current through a larger area. They offered to produce the tools for larger contact disks if we pay for it (laser cut masks) After some discussions between Karel and the company we decided to order 3 sets of 6 crystals, with individually made 16mm contact disks. They resonate about 2 kHz too high in my Paraset and in the transistor oscillator. Adding a small parallel trimmer helps tuning them down to the claimed frequency. They adjust very nice over a large range before the oscillation stops. Nearly no chirp, no jumps…I am really satisfied. They only produce the crystals. They have no boxes/bases or holders left. You get a disk with 2 leads on it. That's all. I use a round disk of phenolic board as base and two 4mm plugs (19mm or 3/4 inch spacing, like FT-171). The lid (not visible on the photos) is black POM tubing. The design of the holder is from Karel. It uses two slotted 0,2mm phosphor bronze strips to hold the crystal from the side without blocking the oscillation. Don't pack them in foam to protect them. No oscillation possible! With the slotted strips the disks are fixed on the side on 4 points. The electrical contact to the brackets has to be made by the applied wires. Never try to ow what I am talking about. A friend from Italy has made the first test-order. Now, because the tools are paid for, they take 12.- Euros per crystal. I can inform you if he is satisfied, when his crystals have been delivered. Karel and I have no deal with that company. You have to do all correspondence yourself. I'm picking up this old message to let everyone know that I also ordered a set of those large crystals from www.Krystaly.cz, and it did take months to have them manufactured, but eventually I got them delivered yesterday. I have a set of useless QRG FT-171B holders and I wanted to find a way to use them to host these new crystals. With the help of a Dremel tool, I enlarged the inner receptacle of the FT-171B case, then I made a thin and "springy" metal clamp out of a tuna fish can, made the two cuts that hold the quartz slab, and here is the result (see attached picture). The metal clamp is glued to the holder at the bottom, with a tiny dot of Super Glue. Another (almost invisible) dot of Super Glue was used to fix the bottom edge of the crystal at the bottom, where it rests on the clamp, to make sure it will never "rotate" onto itself because of the vibrations; maybe this is an unnecessary precaution, but it won't hurt, and it does not seem to prevent the crystal from vibrating freely. So it looks like that using FT-171B holders with these crystals is definitely an option, and a much easier/quicker one than building a custom holder from scratch. By carefully designing the clamp, the slab ended up having only three points of contact with the clamp itself, at about 120° from each other, instead of the usual four. 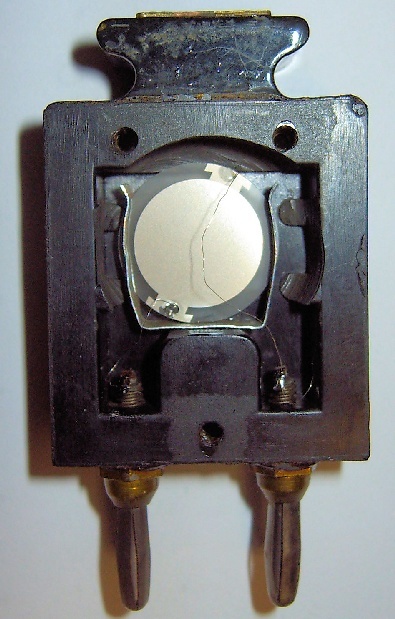 As a matter of fact, the crystal in the picture resonated at 7010.34 KHz with no holder, and at 7010.30 once placed in the holder as shown, so I believe it remains almost as free to vibrate as if there was no holder. By zooming into the picture you may be able to see further details, including the fact that I did not cut the thin metal wires that come with the crystal, in case I ever need to pull it from the holder and reuse it in some other ways. The guys at www.Krystaly.cz seem to have learned from the first order done by Tom and Karel, because I had ordered the crystal in the example for a nominal QRG of 7010 KHz, but without specifying whether it was series or parallel resonance. So they assumed it was parallel, and they made the crystal for 7000 *series resonance*, so that once placed in a parallel resonator it had more chances to be close to the specified 7010, and indeed their assumption proved correct. That's to say that when these particular crystals are placed in a typical tube oscillator, like the Paraset or a a similar one, they will likey resonate about 0.14-0.15% higher than their nominal series resonance. 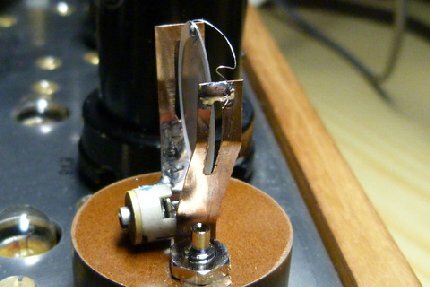 The actual QRG can further be adjusted with the help of a parallel trimming capacitor, as usual. I preferred not to place that capacitor inside the holder, partly because there's no room for it, but mostly because different tube circuits are likely to require a different parallel capacity value to resonate the crystal at the nominal frequency it is intended for, so that capacitor has better be placed in the circuit, not in the holder. In some cases it may be desirable to put the capacitor in series with the crystal, as opposed than in parallel, so again I believe that the proper place for the capacitor is the circuit, not the holder. Hello Carlo and the others! I am glad to hear that the Crystals arrived, and you are satisfied. I like your way to mount the crystal. It is indeed not necessary to form 2 isolated brackets. Your solution is nice. If you machine a slot between the two 4mm male connectors (between the screws inside the box, but leaving an "island"
ones) if you like. I can offer you to do that on my mill. The crystals I got were still too high, but the tuning behaviour is nice, much better then with small crystals. In my case I got more output with the Krystaly XTALs, but the outputs drops a bit when you bring them down with a parallel C too much. I think it is a good idea to supply you valuable info's on the Paraset reflector as well, Carlo! yes, by removing more plastic inside the box is is certainly possible to gain more space. As I said, I prefer to place the capacitor in the circuit, but others may want to enclose it with the crystal, and it can be done, even with FT-171B holders, as you say. As you noticed, I wanted to find a simple solution, also for those who do not have special tools, hence the single-piece bracket. It may be possible even to do away with no bracket at all, by cutting a small groove in the plastic block that separates the holder prongs, and gluing the bottom edge of crystal in that groove with the smallest possible dot of super glue. However I'm concerned that if the box is dropped then the crystal may fracture, even if it is very light in weight and has almost no mass, so using the bracket may be safer, even if it requires more work.